One hour debugging last night tracked down to “two lines – pah – it can be done in one!” bravura earlier in the day. This deserved a bit of further explanation, due to the stupidity involved. My code was giving an unexpected result and I was having a hard time figuring out the problem. The unexpected result was that a resampled set of 2D coordinates were not being rotated randomly. I was fortunate to be able to see this otherwise I would have never found this bug and probably would’ve propagated the error to other code projects. I narrowed down the cause but ended up having to write some short code to check that it really did cause the error. My checks showed that a single point at 1,0 after matrix multiplication with this method gives. And it’s so obvious when you’ve seen why. 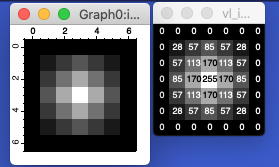 The four numbers in the rotation matrix are, of course, not independent. I won’t make that mistake again and I’m going to try to think twice when trying to save a line of code like in the future! Part of a series on computers and coding.